The sun was low in the blue sky, sending its gleaming rays over Schloß Liebenberg; foreheads ran with salty sweat that stung the eyes. Not good conditions for a duel…. No, that was not Sergio Leone’s Once Upon a Time in the West – it was one of the many concerts of Cello Duello that are celebrated by press and audiences. “Cello Duello” is both name and description, a musical contest held on the stage by the two musicians. “Cello Duello sounds damned warlike. But it is nothing of the sort. While the gentlemen Jens Peter Maintz and Wolfgang Emanuel Schmidt bear weighty “arms” and virtuosic bows into the fray, they exercise cooperation rather than contention.” (Berliner Zeitung) Their parts are absolutely equal in status, sometimes alternating at a rattling pace; an “utter artistic pleasure” (Rhein-Neckar Zeitung). Cello Duello celebrated twentyfive years on stage in 2016. 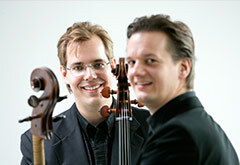 Jens Peter Maintz and Wolfgang Emanuel Schmidt studied together in the class of Prof. David Geringas in Lübeck. 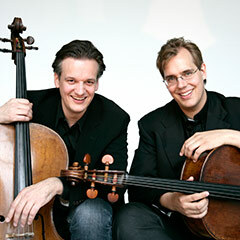 Needing to find a concluding piece for one of their teacher’s marathon master-class concerts, they adapted Paganini’s Moses Fantasy for two cellos – and Cello Duello was born. Cello Duello has performed all over the world and were invited to the most prestigious cello festivals: the Kronberg Cello Festval, the Rutesheim Cello Academy, the Cello Biennale Amsterdam and in 2016 the Piatigorsky Cello Festival in Los Angeles. Cello Duello presents a concert programme that is both most amusing and artistically sophisticated, comprising original compositions from the Baroque and early Classical periods through high Romantic works by various cello virtuosos or composers who mostly played the cello, like David Popper and Jacques Offenbach, to works they commission from composers like Jan Müller-Wieland. Soren Nils Eichberg dedicated his Double Concerto “House of Mirrors” to Cello Duello, Enjott Schneider wrote his Double Concerto “Dr. Jeckyll and Mr. Hyde” for the duo. Additionally, their own arrangements for two cellos of works like Paganini’s Moses Fantasy and the famous passacaglia of Handel-Halvorsen play a central part in their programmes. Solo Musica released the Cello Duello CD in November 2010 featuring duos by Haydn, Offenbach, Paganini and Handel-Halvorsen as well as Wolfgang Emanuel Schmidt’s arrangement of Morricone’s “Once Upon a Time in the West” for 6 cellos. WERGO release Enjott Schneider’s “Dr. Jeckyll and Mr. Hyde” (recorded with the Deutsche Symphonie-Orchester Berlin) in 2016.